This picture shows two superheated 0-8-0s on a shed somewhere, perhaps Crewe North or Crewe South. No. 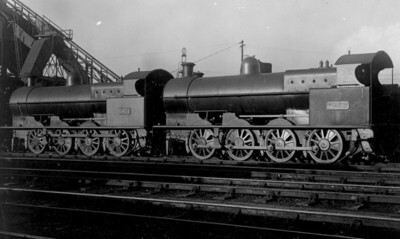 2571 on the left was originally a 'B' Class four-cylinder compound and was converted to 'G1' in April 1925. No. 545 on the right was built as a 'G1' Class in May 1916 and was fitted with a Belpaire boiler in 1925. So it looks as if they have been newly turned out of Crewe Works after they had been fitted with Belpaire boilers. No. 2571 has the Webb style of numberplate and no. 545 the later type showing the building date. But they are not in steam and indeed have no tenders. So why not? Are the engines not simply awaiting tenders? I recall that the LNWR had fewer tenders than engines as the tenders could be repaired more quickly, which resulted in a tender change after each works visit (an early application of Just-In-Time principles!). Perhaps in this case the tender repair process has become disrupted for some reason, resulting in a (temporary) shortage. Obviously, as Philip says, the engines are awaiting tenders. But why? And why not in Crewe Works but on the South shed (or is it the North shed?). The explanation in Mystery no. 153 applies here, I suggest. The engines have been repainted plain black in the erecting shop and retain their old LNWR number-plates, due to the paint shop being closed. Tenders are not available for them, due to re-organisation in the Works, and they have been moved out to the South shed(?) to await tenders coming from the Works or, quite possibly to be fitted with spare tenders available on the shed.